In April of last year, former MakerBot COO Samuel Cervantes launched the Solidoodle, a $500 3D printer. We were a bit taken aback by the price point -- after all, his former company's product had seemingly set the standard for consumer-facing 3D-printer pricing at around $2,000. We're hoping you've got both hands firmly clutching your hat when we tell you that the 3Doodler, a 3D-printing pen from the crew over at Wobbleworks, is going to run a whopping $75 at launch -- and heck, if you get in early on the company's recently launched Kickstarter, you'll be able to snag one for $50. Before we go any further, however, let's get some things out of the way. For starters, it's best to take the 3D printer thing with a grain or two of salt. 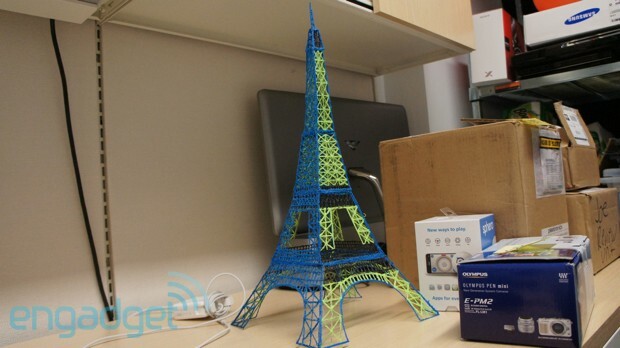 Calling the 3Doodler a 3D pen is a bit like calling a high-end ink pen a 2D printer. The device is actually quite simple, but pretty brilliant. It essentially takes the heated extrusion head off a 3D printer and incorporates it into a standalone device. A single piece of plastic (ABS or PLA, for the more environmentally minded out there) is threaded through the back, fed through the pen and comes out melted through the tip. Yes, like its 3D printer brethren, it works a bit like a hot glue gun. You can draw flat on a piece of paper or follow along with stencils, if you're not all that artistically inclined. The real trick, however, is writing upward, essentially drawing in the air. There are two buttons on the front of the device, which let you control the speed of the extrusion. The higher speed works just fine on paper, but if you want to hit that third dimension, it's best to slow things down, allowing the plastic to solidify as you build up. It's also possible to create three-dimensional structures by printing out 2D sides and essentially welding them together afterward with a bit of plastic, as the company did with its rather impressive Eiffel Tower model. The Wobbleworks guys let us take the pen for a spin for a bit. It's easy enough to use, but actually drawing a three-dimensional object takes a good deal of trial and error. We're sad to say that we hadn't quite mastered the thing by the time we had to give it back. There's also the fact that if you're not an artist, this thing isn't going to magically teach you how to draw. We're told, however, that the company's going to put a few of these in the hands of some Etsy users, so we should be seeing some pretty cool one-off results -- some of which will go toward rewarding Kickstarter donators. The first-gen unit needs to be plugged in, though the company tells us it's working on a battery-powered version. No telling how long that would actually run, given the extruder and the big onboard fan. It's also looking at the possibility of a more kid-friendly version (the main problem being that hot tip), and when I suggested a Thingiverse-like database for stencils, company reps nodded their heads knowingly. It should be pointed out that what you're looking at here is a prototype (there's an even older version in the gallery). The final version will be roughly the same size, with a different body. The company is looking for $30,000 in funding, in all. You can get in on that action by clicking on the source link.